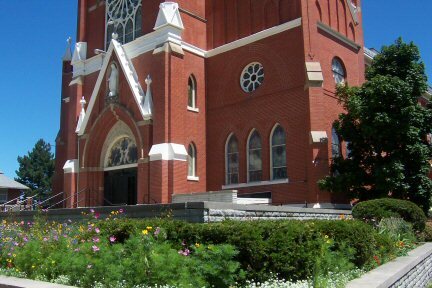 Is visitation church in Bay city, Michigan haunted? Visitation Church was built to serve the growing Catholic population. At the time, there were 450 Catholic families within the bounds of the parish but this number rapidly grew so new areas of the church were built. The building today serves its original function as a church. The old story about this location was known as "The legend of the bloody hand", but after being informed by a worker of the church this story seems to be nothing more than an urban tale probably started by local children. The story is still below, but doesnt seem to hold truth. It has been reported by people to see the image of a severed hand within the church, particularly within the sacristy and basement area. The hand is said to appear in varied levels of intensity, as some report seeing a white-ghostly like hand appear and quickly vanish, were others claim to see it as if it were physically real with blood dripping from the stump. Who the owner of the hand is and were it came from seems to remain forever unknown as many people have died close to the property. The only unexplainable happenings at the church were of the old bells which would ring on there own with no explaination until they were removed arond 5 years ago.